When thinking about the past or future remember this no matter how much you regret past can't be corrected and no amount of worry can change the future. Always look ahead and be prepared for everything instead of looking back and regret. For healthy and simple life, live without any regret, expect less, give more and love yourself. Never give up on something you really want. Remember, it's difficult to wait but more difficult to regret . Furthermore, God said Trials are not reasons to give up, but a challenge to improve our lives. It is not an excuse to back out, it is an inspiration to move forward. Instead of making a lot of excuses, make a little progress. Instead of looking back with regret, step forward with enthusiasm. Choose to view your life based on the best of what is possible. Choose to define yourself based on the person you know you are capable of becoming. If you believe it, you can do it. 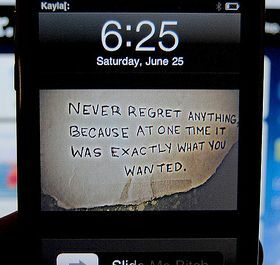 You do not have to suffer from regret. You can stop beating yourself up, it is not serving you. 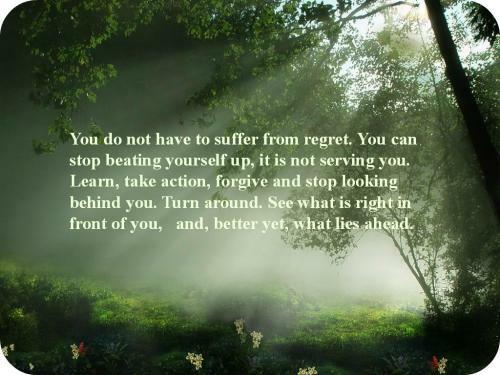 Learn, take action, forgive and stop looking behind you. Turn around. See what is right in front of you, and better yet, what lies ahead. He's going to be sorry he lost you, so stop worrying. Forget the past, forget the pain, and remember what an incredible woman you are.